Joanne and Ben got married at Bordesley Park in Redditch, Worcestershire. Available only as exclusive use, Bordesley Park offers so much for brides and grooms and photographers alike. There's a beautiful bridal preparation room with space enough for your entire wedding party, a stunning converted Tudor barn ceremony room, a formal garden and lots of lawn. It makes the perfect location for photos from the first thing in the morning until the last thing at night. I had spent all morning with Joanne and her bridesmaids, and it had been a relaxed if somewhat emotional time, with lots of laughs and a few tears here and there. Jo had written her bridesmaids and her mother a personal letter each, and there wasn't a dry eye in the place! Still, it made for some great photos and I managed to capture some really moving moments that help tell the story of the wedding day. 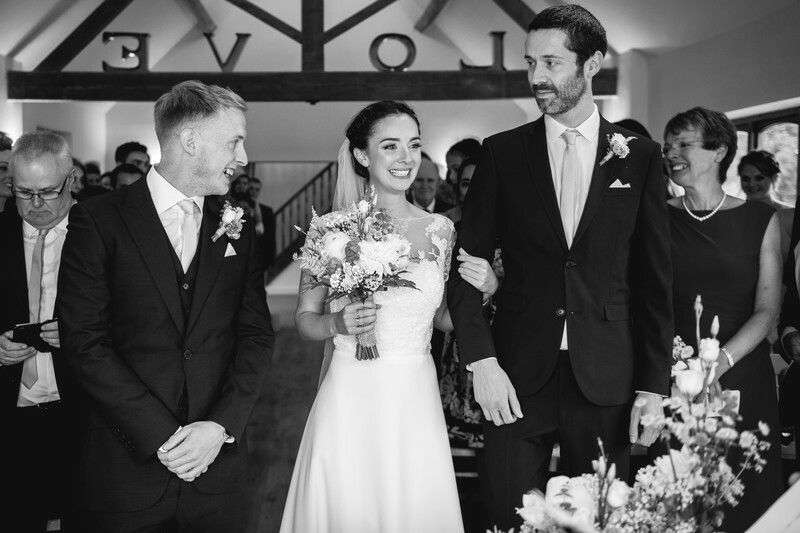 Joanne was given away by her brother, and upon meeting her soon-to-be husband at the end of the aisle, gave the biggest smile of the day. Ben seems to be enjoying himself too, but have a look at the face Jo's brother is pulling! The wedding ceremony was lovely. 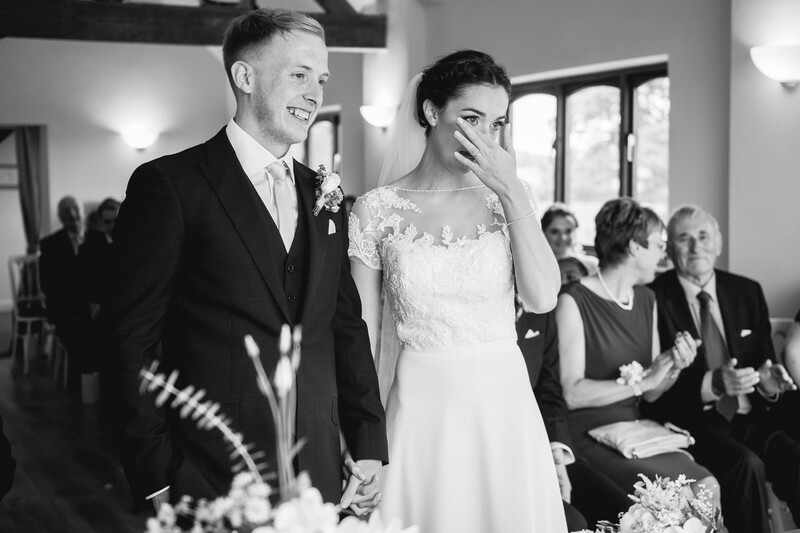 Upon completing their vows that made them husband and wife, Joanne was visibly quite emotional. The main image for this article shows her wiping a tear from her eye. Another detail I love with this image is on the right hand side of the frame, how Joanne's mother is smiling and has turned to Joanne's grandfather to see his reaction.